(from press release) "Fernandez recently returned from the 2008 Nike Outdoor Nationals, where he dominated the 3,200 meters with a first-place time of 8:34.40, crushing a 29-year-old national high school record of 8:36.30 set by Jeff Nelson. 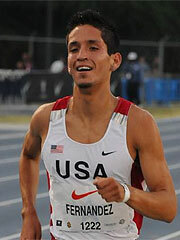 Fernandez’s 3K split of 7:59.83 also broke the national record (8:03.67) set by Galen Rupp in 2004. Also the 2007-08 Gatorade California Boys Cross Country Runner of the Year, Fernandez placed first in the 8K race at the USA Cross Country Championships World Championship Team Qualifier with a time of 24:18. He finished 25th at the 36th IAAF World Cross Country Championships with a time of 24:15, leading Team USA to a sixth-place team finish in Edinburgh, Scotland." National Girls - Chanelle Price - Easton PA senior wins the honor. (from press release) "... No stranger to international competition, the senior half-miler placed sixth in the 800-meter run against a world-class field at the Prefontaine Classic earlier this month with a time of 2:01.61, clocking the second-best time in scholastic history and eclipsing a milestone set by track legend Mary Decker. Shattering the state record and winning her third consecutive gold medal in the 800-meter with a time of 2:02.90 at the PIAA Class AAA state meet in May, Price helped the Red Rovers to a seventh-place finish as a team. A two-time 800-meter champion at the Nike Outdoor Nationals, Price also won the 800-meter event at the 2008 National Scholastic Indoor Championships and the 2007 Nike Indoor Nationals. 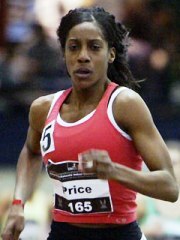 Price is a five-time individual national champion and has qualified for the upcoming 2008 U.S. Olympic Trials."